The Nungung village’s waterfall is 900 meters above sea level and seventy meters high. To access it you must descend a long series of steps down a deep gorge from the Nungnung Waterfall Carpark. The descent can be a little slippery, so make sure you’re looking after any kids who are with you. 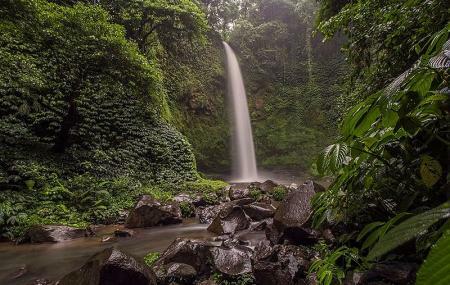 At the bottom, you’ll find one of the island’s most beautiful waterfalls, with rocks in front of you, lush tropical vegetation on all sides, and the air misty with water fog. And remember that once you’ve climbed down, you also have to climb back up to get out of the gorge. There are little landings on the steps if you need to catch your breath. How popular is Nungnung Waterfall? People normally club together Munduk And Melanting Waterfalls and Sangeh Monkey Forest while planning their visit to Nungnung Waterfall. Unbelievable beauty you've only ever seen in movies. Long walk back up though. It's even nicer when raining. Swimming is possible. Rocks are slippery. Hard to get close to the falls because the spray is so fierce! Not very busy. Costs 15k to visit. Food options nearby are limited. Beautiful waterfall surrounded with full of greenery and colorful dragonflies and other species. Possible to take bath but it's depends on weather. Before to go down please bring water bottles and some snacks for restore your stamina when you return walk upstair. Not very crowded and the trek isn't too bad. Going down is a breeze, getting back up is a workout. The waterfall is stunning, so it's worth it. Also, there are no changing areas there so if you wanna go for a swim either wear your bathing suit or maybe bring a big towel/ blanket. Absolutely worth going down all those stairs for a swim under this waterfall! The wind it generates is so strong that water droplets fly upwards behind it! Yup! You can make it behind by either walking on the left side or with a little swim on the right! Water doesn't always flow downhill!!! Great waterfall, really is immense and beautiful. The hike down as other people said is quite steep and even harder on the way up. Avoid the waterfall on rainy days as the walk path is slippery. You can bring your own swimsuits to take a dip but take note the waterfall area is extremely humid and wet due to the waterfall being in a basin so you will need waterproof bags. Last thing to note you need to pay a small entrance fee of about 20,000 rupiah.